California Notaries are reporting being asked to notarize documents with outdated certificates that lack the Notary certificate wording requirements that went into effect on January 1, according to an NNA online survey conducted last week. Since the beginning of the year, all California acknowledgments, jurats and proofs of execution are required to include a consumer notice. Of the more than 700 survey respondents, 51 percent said they have been asked to notarize documents using certificates without the mandated notice. Of those, 87 percent said they were able to resolve the issue by attaching a loose notarial certificate with the new wording to the document. NNA members can download updated CA Notary certificates for free when they sign into their online account. The change has raised many questions from businesses as well as concerns from Notaries around the country that work with documents sent between California and other states. More than 85 percent of survey participants said “few” or “none” of their signers knew about the new certificate wording. While signers are not expected to know Notary law, this result underscores the need for California Notaries to pay close attention to the certificates that accompany documents. Notaries who use the old certificate forms are out of compliance with the new law. Documents notarized without the consumer notice are liable to be rejected by the receiving party, particularly California county recorders who handle the enormous number of land record documents, such as deeds, deeds of trust, and related real property records filed in their offices. Thirty-three percent said “not many” companies knew of the consumer notice requirement while another 26 percent said “none” of the companies they work with knew about the change. However, 30 percent said that “most” of the companies they work with knew about the wording change. Sixty percent of the surveyed Notaries who work in offices said their employer knew about the new certificate law. I would never expect a signer to know about the certificate. I would, however, expect that notaries should know. I have already seen several documents come across my desk with old notarial certificates, obviously provided by the notary, not the signer. 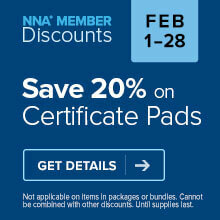 I learned about the certificate wording change through my NNA membership. Unfortunately not all notaries are members, or they didn't pay attention. I would think that the Secretary of State's office, which oversees notaries, should be sending a communication to all California notaries when an important change like this is made. In my capacity as city clerk (and Notary), I am the one who is ending up spending time and effort sending notarized documents (slated to be sent to the recorder's office) back to homeowners because the notary they used neglected to use the correct form. That shouldn't be my job. I find it ironic that, while the article is about particular wording, the writer, David Thun, writes a grammatically incorrect sentence. Are there editors at the NNA? He wrote "But many questions linger because, under the law, these licenses come with wording that limits how they be used." "...how they be used"? Could an editor please correct this to read "how they are to be used"? I hold the NNA to high esteem and values. Please live up to that vision. Hello Brett, We've corrected the sentence. Thanks for bringing the issue to our attention. I'm glad my notaries and I are members of NNA because they sent the update to all of us soon enough to notify our boss and our compliance officer to update our documents. THANK YOU NNA! the Secretary of State did send out a postcard regarding new wording. Hi Nelly, I have no recollection of receiving a postcard from the Secretary of State. But I'm happy to know that one was supposedly sent, because I can at least respond back to notaries who ask about it. Did the NNA lobby the State to change the Acknowledgements and Jurats to sell more pads of the stuff? I had to trash about $40 worth of paper this January of suddenly out dated materials. Just wondering. Hello Jordan. No, the NNA did not lobby for this bill, it was driven by the Secretary of State's office. They reached out to Bill Anderson, our VP of Legislative Affairs, for his input on the exact wording and placement of the consumer notice. The change was made by the state as a measure to protect consumers. I am a certified Notary Public in the State of California and I received no postcard notification from the SOS. I ONLY learned about this by reading my NNA Bulletins.